A lot of Christian bands and singers have come and gone over the past 28 years, but the Itzels have stood the test of time. Bill and Karen, along with their children, Jessica, Ryan, Shannon, and Siri have now been touring full-time for almost 3 decades, and even after 56 recordings, 360 original songs, and over 3300 concerts, they are more relevant than ever. The Itzels have designed their ministry to supplement the work of the local church. 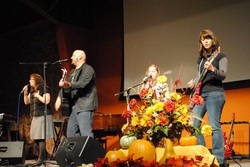 An Itzels' concert includes original music, modern and traditional hymns and worship songs, an emphasis on family relationships, and teaching of the Word. There are many accolades that the Itzels could focus on such as Bill's number-one songs, ”Saved To The Uttermost" and "He's Still In The Fire" with the Speer Family, appearances on the Bill Gaither videos, 2 Grammy and 2 Dove award nominations, and headlining concerts for over 40,000 people, but to the Itzels, there is no greater thrill than hearing the voices of God's people lifting musical praise to their sovereign Lord and Savior, Jesus Christ. In 1999 Bill and Karen officially sat down and totally re-worked the vision for their ministry. With a philosophy that was focused on how the local church operates and ministers, they were ready to become a one-of-a-kind ministry that churches could count on to fill “pulpit-time” in the 21st century. In 2012 Bill and Karen formed the non-profit ministry “Bill and Karen Itzel Ministries Inc.” for the specific purpose of spreading the gospel through biblically based songs and mission outreaches. In 2017, the Itzels moved to Mount Airy Bible Church as their home church and working with their praise team, lead worship there most Sunday mornings. While the Itzels have no real answer as to what style they consider themselves (contemporary, country, rock, gospel, traditional), they have always been balanced and blended musically, with the emphasis on the lyrics and message of the songs. The Itzels are singers/songwriters who are committed to Christ, committed to truth, and committed to excellence.